Cumbria Tourism is urging businesses, residents and visitors alike to voice their love for the county as part of this year’s Cumbria Day this Wednesday 23 January 2019. Cumbria Day will see businesses from across Cumbria being brought together by the county’s six MPs in the Palace of Westminster, alongside representatives from key organisations including Cumbria Tourism. 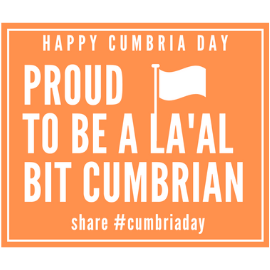 To support this high-level celebration of all things Cumbrian, the county’s official Destination Management Organisation has launched an online campaign across its 300,000 followers on social media to get #cumbriaday trending. At the same time, Cumbria Tourism is urging its 2,500 member businesses and partners to throw their weight behind the event by sharing #cumbriaday and showcasing why it is #theplacetobe. The organisation is also encouraging Cumbria fans to share their best images, anecdotes and fun facts about the county – whether that’s someone who’s visited in the past, has family connections to the area or simply admires the Lake District, Cumbria from afar. Managing Director of Cumbria Tourism, Gill Haigh, says, “It’s little wonder that visitors come back to Cumbria again and again. It is a unique and dynamic county full of diverse businesses, world-class landscapes and authentic people who are staunchly proud of this special place. People can get involved by following @golakes and @cumbriatourism and sharing stories on social media.